iRobot Roomba 690 Review - How does this robot vacuum perform in our home with two dogs? This is a 100% honest, 100% authentic iRobot Roomba 690 review. Dadtography was not compensated in any way for this post. Some links below, marked as (af), may be affiliate links. Sales made resulting from clicks on affiliate links provide a small percentage of each sale to Dadtography.com. All images are unedited originals taken by Dadtographer Daniel. Please don't use our photos without permission. The Geek Dad in me loves anything that allows me to "automate" my home and my life. I'm on a personal mission to max out my home's automation capabilities, so when my wife agreed to let me try out the iRobot Roomba 690 robot vacuum, I jumped at the chance. We've been using our iRobot Roomba 690 for around a month now. Our home is probably the exact type of home that this vacuum was intended for - we have lots of tile floors, two dogs and two boys. Check out how the iRobot performs after our real-world testing. Learn more about the iRobot Roomba 690 robot vacuum. 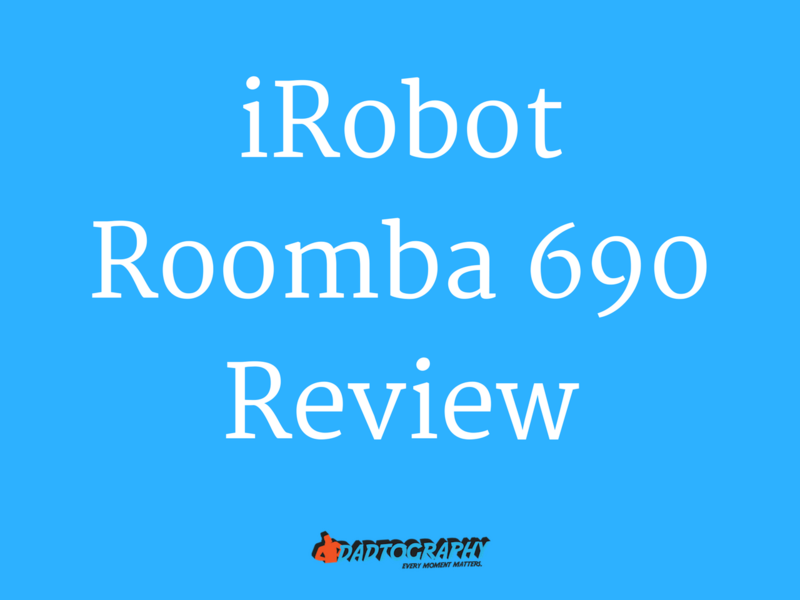 Learn more about setting up the iRobot Roomba 690. Check out the technical specifications of the iRobot Roomba 690. How well does the iRobot Roomba clean? Learn more about our experience with this robot vacuum. How well does the iRobot Roomba 690 navigate our home? Learn more about our experience here. How does the battery hold up when using the iRobot Roomba 690? Learn more about our experience here. Is the iRobot Roomba 690 easy to use? We put it through the paces in our in-home tests. Here are some frequently asked questions (FAQ) and answers about the iRobot Roomba. Check out some of our unedited images of the iRobot Roomba 690 robot vacuum. An intro to the iRobot Roomba 690 robot vacuum. There are a lot of robot vacuums available out there in the market, but the Roomba is the original. I remember owning my first Roomba years ago - and it wasn't the best experience back then. Well, times have sure changed. A few years have passed and the iRobot Roomba is way more functional, user-friendly and connected than it's ever been. I was skeptical at first, but the Roomba 690 has proven to be a real help and time-saver in our home. It won't keep your home clean all by itself, but for routine "maintenance" of your floors, it does a pretty good job! Is the iRobot Roomba 690 easy to setup? You have to start a review of the iRobot Roomba with commentary on how difficult or easy it is to setup and get it running, right? The short answer to if the iRobot Roomba is easy to setup is, unfortunately, no. It's not easy, but we did manage to get it setup and running in about 30 minutes of tinkering. Connect the iRobot Roomba to our Amazon Echo / Alexa. Here are some helpful instructions to get you started as well. Don't forget the hidden compartment box at the bottom when unpacking! Getting our iRobot Roomba 690 connected to Wi-Fi took about 30 minutes of tinkering. What are the iRobot Roomba technical specs? You are using a compatible router. See the list of incompatible routers. How's the iRobot Roomba cleaning quality? The other big thing I'm sure you're interested in when it comes to the iRobot Roomba is how well it cleans. It's funny, because sweeping and mopping floors were both my tasks well before the Roomba entered our lives. Sweeping the main floor of our home didn't take long to accomplish, but with two dogs and two boys, it also didn't stay clean for very long! I was hopeful the Roomba would help raise the level of clean and reduce the number of times per day I had to sweep our floors. Let me be clear - the iRobot Roomba 690 does well for it's intended purpose. It works pretty well on tile and wood floors as a sweeper. It's not a deep-cleaning machine, though. It's cut the number of times I have to sweep our floors in half. My secret is that I've set it up to run as we leave the house. As long as the floor isn't cluttered, it runs while we're away and we come back to a cleaner house than we left. Success! It works pretty well on tile and wood floors as a sweeper. It's not a deep-cleaning machine, though. How's the iRobot Roomba mobility and navigation? The vacuum's ability to navigate your home without getting stuck or hung up on something is very important. This was one of the biggest issues with the original robot vacuums from years ago - they'd get stuck way too easily. The algorithms that control the modern iRobot Roomba are much improved, and it seems far less likely to get stuck over it's predecessor. That said, it can (and will) still get hung up on things occasionally. It comes with one Dual Mode Virtual Wall® Barrier (2AA Batteries included) to help it navigate your home. This small device can be placed as a straight-line barrier for doorways, for example, or it can be used to protect a certain radius. A common use of the barrier is around a dog bowl, for example. Most homes could use more than one of these devices, so it's somewhat unfortunate the Roomba only includes one by default. The iRobot Roomba 690 does not handle clutter very well. Your floor should be picked up before you set the Roomba out on a sweeping job. Even small items, such as shoes, can disrupt the path of the Roomba. The Roomba also doesn't handle cords and cables very well. It likely won't damage the cords and cables, but it doesn't do very well navigating when they are in the path of the vacuum. Finally, the iRobot Roomba isn't good for the "nooks and crannies" of your home. It doesn't do well getting into corners or other tight spaces. It does pretty well along straight-line walls and will eventually map out an optimal path, but don't expect the vacuum to get into every space of your floor. How's the iRobot Roomba 690 battery life? As I mentioned earlier, we've been using our iRobot Roomba 690 for just over a month now. We've run the Roomba on our main floor well over a dozen times and the battery on the 690 has held out very well. The Roomba 690 can regularly clean for well over an hour on a full charge. I haven't been able to figure out how long the device cleans on it's own, though. I've regularly started a cleaning run for it to return to the base with almost a half-full battery charge. I'm not sure why it returned to the base so soon. It also can have some difficulty lining up with the charging base at times. It's somewhat entertaining to watch it circle like a jet about the land at the airport and re-align its approach into the charging station. Is the iRobot Roomba 690 easy to use? The iRobot Roomba 690, combined with the Roomba app makes the device very easy to use. We also use our Roomba with our Amazon Echo as well. You can use the mobile app to schedule cleaning days and times to run your Roomba on a regular schedule. The scheduling feature is cool, but if your home is like ours, running on a specific schedule usually won't work. Our preferred method is to use the home automation features that are compatible with Roomba. For example, we can use a voice command and ask, "Alexa, tell Roomba to start cleaning" on our way out the door. We can also setup an IFTTT "recipe" to have Roomba start cleaning when we leave the house automatically. There are a lot of options for scheduling your Roomba. It's just a matter of figuring out what works best for your home and family. Just don't forget to do a quick pickup pass of your floors before you start. You'll get much better results if the floor is free from clutter! "Alexa, tell Roomba to start cleaning." Q: Does the Roomba 690 work well on carpet? A: It does "okay" on carpet, but really works much better as a sweeper on hard surface floors such as tile or wood. Q: Will the Roomba 690 replace my upright vacuum? A: No, Roomba's really aren't a good replacement for an upright vacuum. It may mean that you have to use the upright less often, though. Q: Is the Roomba 690 compatible with Google Home? Ensure Roomba has already completed Wi-Fi setup. Open the iRobot HOME App and navigate through Menu ➔ Smart Home ➔ Google Home ➔ Get Started to begin setup. If you do not see this option available, visit Software compatibility of a Wi-Fi connected Roomba and the iRobot HOME App to check if the Google Assistant is compatible in your region. Follow the directions in the Google Home app to link your Wi-Fi connected Roomba vacuuming robot by authorizing the Google Assistant with your iRobot Home account. Q: Does the Roomba 690 work well on pet hair? A: Yes! It does great with our two dogs and helps keep our floors clean throughout the week. Q: How does the Roomba 690 handle Legos? A: As a home with two boys, we can testify Legos are safe with the Roomba 690. They're easy to retrieve out of the vacuum dust bin. iRobot Roomba 690 Review - Don't forget the 'hidden compartment'! What do you think? Do you own an iRobot Roomba, too? Leave a comment below with your experience using your robot vacuum!